Accra, June 19, GNA- President John Agyekum Kufuor on Saturday left Accra for Abuja, Nigeria, to consult with President Olusegun Obasanjo on the Ivorian crisis and to review steps taken to bring peace to that country. Foreign Minister, Nana Addo Dankwa Akuffo Addo and Mr Kwabena Agyapong, Presidential Spokesperson, accompanied him. In a pre-departure interview, Mr Agyapong told newsmen that President Kufuor would also pay a courtesy call on Catholics of Sokoto. He said after the meeting in Nigeria, President Kufuor would leave for Burkina Faso for the opening of the "AU Sub-Regional Summit on Water Resources Management, Biotechnology and Agricultural Productivity". 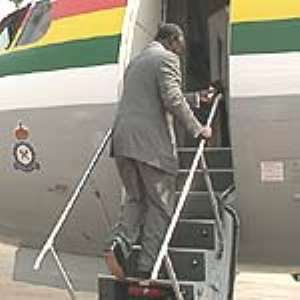 The President was seen off at the airport by the Inspector General of Police (IGP), Nana Owusu Nsiah and Dean of the Diplomatic Corps, Ibrahim Omar and top government officials.